Designed circa 1905 by Scott Campbell, The Pass is a large, roughly L-plan villa, incorporating Arts and Crafts and Baronial detailing. 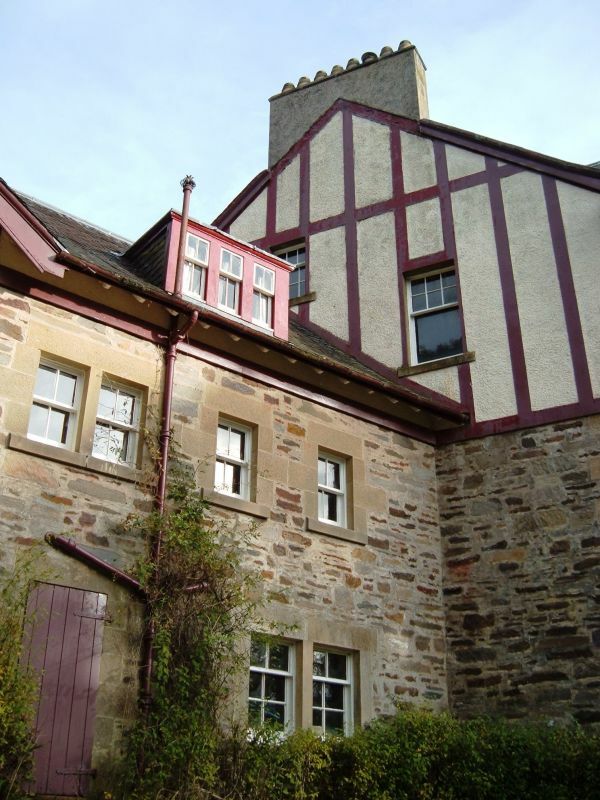 It is situated in a secluded position, high on the side of a hill on the N side of the Aberfoyle-Stronachlachar road. The Pass is a virtually unaltered example of a large Edwardian villa with interesting detailing and a very well preserved original interior. The main part of the house is a rectangular block with a narrow SE entrance front and a long SW facing principal elevation, of which glimpses are caught while approaching up the steeply winding driveway. The SW elevation is 2-storey, raised over a full basement to accommodate the sloping ground and ensure that the principal rooms have an uninterrupted view over the trees to the hills beyond. It is of 4 bays, with a slightly advanced gabled bay to the left with a full height canted bay window; the right bay is a full height crenellated bow which clasps the angle and returns onto the entrance front. On the left side of the entrance (SE) elevation is the 3-bay gable end of the main block, with the castellated bow to the left and a keystoned ocular window to the centre of the apex. The off-centre entrance doorway is sheltered by a timber columned, segmentally-arched porch, which extends to the left to form a flat roofed veranda. The right section of this elevation extends from the side of the gable-end to meet the steeply rising hill to the right, and screens the rear of the house; at ground floor level double doors in a segmentally arched opening would have allowed carriage access to the rear of the house. At 1st floor level, a long glazed conservatory corridor with a pitched roof is jettied out from the screen wall and at the far end widens out to the SE into a 5-sided canted bow built onto the hill; these have continuous glazing with rustic timber trunk mullions. The service wing of the house is a 2-storey and attic, rectangular-plan block of subservient proportions extending unobtrusively at an angle from the NW gable of the main block. This NW gable has half-timbering detail to the upper storeys as does the gable-headed left bay of the 3-bay service block. The interior has undergone virtually no alteration since construction; remaining is all original woodwork, including curtain rails, all chimneypieces (in almost every room), including substantial chimneypieces with ornate overmantels to principal rooms, all plasterwork, some original wallcoverings including dining room, attic billiard room and full decorative scheme in parlour. The main door gives access to a hall which runs the length of the rear of the house, and also contains the stair; the principal rooms lead off the left of the hall. There is a timber-chimneypiece with overmantel to the left. The timber half-turn stair with landings is enclosed by a timber parapet to the lower flight, which is terminated by a squat timber column which extends to the ceiling; the stair is lit by 3 rectangular windows of diminishing heights, all with swagged designs in coloured and leaded glass. The service wing, accessed from the far end of hall, retains the majority of original fitted furniture. The 1st floor drawing room, retaining the original lighting scheme, gives access to the conservatory. The attic floor has bedrooms with tiled chimneypieces, and coloured and leaded glazed doors, and a large coomb ceilinged billiard room with tiled chimneypiece, giving access to small lookout point on top of the crenellated bow. Random rubble with tooled sandstone quoins and margins; smooth ashlar to canted bay. 2-leaf timber-panelled storm doors, timber and glazed inner door with baluster style astragals. Timber sash and case windows, 2, 4 or 6 pane top sashes and single pane bottom sashes to main house, 4 or 6 pane glazing to service wing and rear; multi-pane casements to conservatory. Pitched roof; graded slates; stone skews and skewputts, broad sparred eaves, plain bargeboards. Corniced gable-end and wall-head stacks with circular cans. At entrance to driveway from road, timber openwork gates; 1 square-plan gatepier, 1 circular-plan crenellated gatepier, short curved rubble wing walls with ashlar copes.